Synopsis: He knows trouble when he sees it. When a gorgeous woman stumbles into the building, Drake knows she is far from home. Dressed in a fine gown and with the mannerisms of a perfect lady, she is way out of his league. And she immediately recognizes his roguish ways, vowing to steer clear of him. Yet, when the lady finds herself in danger, it's the womanizing captain who saves her hide. And stirs things inside her that she's never felt before. 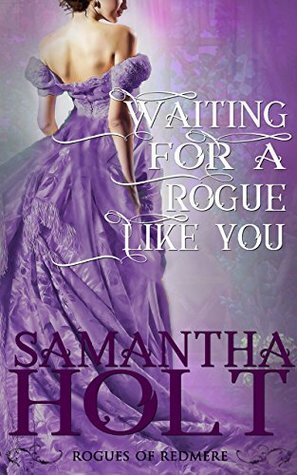 Julianna is on the hunt for her brother after escaping an unwanted betrothal to a ruthless man. She knows her fiance will follow her to the ends of the earth and she needs somewhere to hide away and begin a new life in secret. But falling for a captain who is far too charming and handsome for his own good was not in that plan. Her heart didn't get that message and the pair are soon up against more than one person who wants their tryst to end. No kidding, when I saw this book was available to review, I jumped in my seat and squealed a little. My husband looked at me like I was nuts and maybe I am, but I had to request it. It's the third in the series and I've loved both of the previous installments. I just knew this one would be another hit and it was. It really was. These two were a hoot from their first interaction. Their bickering was entertaining and their chemistry was hot. I think this is my favorite couple in the series so far, mostly because I love the way the trust was built between them. Even when they faced opposition on a few sides, they defended one another, stuck together, and helped each other to grow. The romance was full of steamy moments and some sweet ones. The plot wasn't very intense but mostly ran in the background. We knew the threat was still there, but our couple were more focused on discovering each other and hiding their newfound love from a grouchy brother. By the way, I foresee a fun story when Knight finds his own match. That is one broody man. Another fantastic historical romance and I hope there is more to come. Five suns!